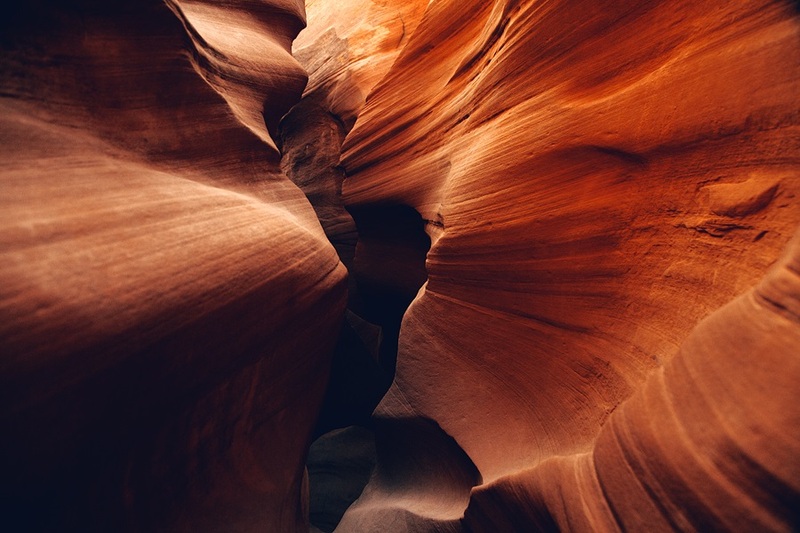 Like the regular canyons, slot canyons are formed by erosion and the natural wear of sandstone and limestone rock through hundreds of years. These gorges are water-sculpted and, thus, shaped smoothly and coiled fluidly. They are much deeper than they are wide; some would even look like only water could go through them. The narrowest slot canyons are less than 3 feet at the mouth, but can drop as high as 100 feet. Because of this characteristic, adventures to such narrow abyss guarantee exciting exploits but could also be dangerous. It is advised to be properly equipped and be accompanied by licensed tour professionals. If you feel your world is closing in on you, wait till you get to any of these five exceedingly beautiful slot canyons from all around the world. You’ve probably seen the photo of these psychedelic orange walls with the white light that streams into the claustrophobic space. It looks like a sacred temple with its spiral arches lit that way. 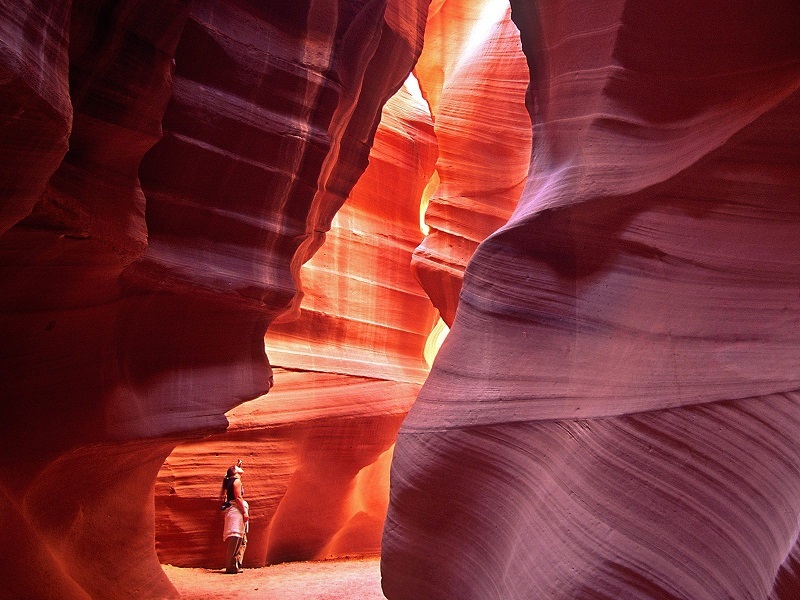 Antelope Canyon is not only photogenic, it is also unbelievably gorgeous. The canyon is located in Navajo land, Arizona, USA, and is one of the most photographed and most visited slot canyons in the world. It would be imprudent to venture without a qualified guide into this deceivingly beautiful abyss, because this is a flashflood-prone site and adventures could easily turn to tragedy. Without the stream of sunshine through them, gullies could really get spooky as this aptly named slot canyon. If you heard that slot canyons are narrow, this one isn’t – it’s tight! It’s a sideways walk for the most part of this canyon, with barely 15-inch width in most places. It is best to measure your girth first before attempting this rocky needle hole. Spooky Gulch is obviously not for everyone especially the claustrophobic. But it is for the nature adventurers who race with their adrenalin to be in the most extreme explorations. It is located in the Hole-in-the-Rock Road, Escalante, Utah, USA. 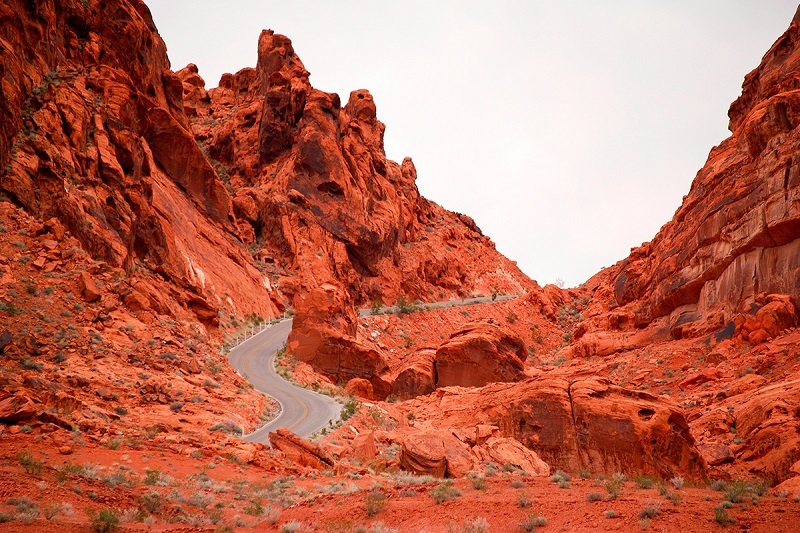 In the Valley of Fire Park in Nevada, USA, is a slot canyon that boasts of 150 million years behind it. And it has pastel-colored horizontal lines to show its age for. Pastel Canyon is certainly a concrete example of growing old beautifully and gracefully. The smooth and flowing sandstone surface measures 20 feet tall. Exploration of its 600-foot length is possible but would take half a day. 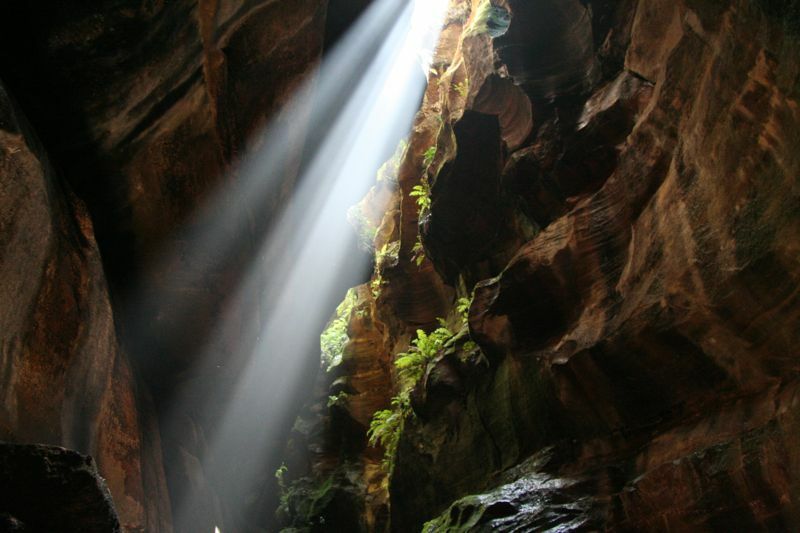 Australia’s Blue Mountains in Sydney, Australia hide many amazing slot canyons. Some of these are the Tiger Snake Canyon, Claustral Canyon and Water Dragon Canyon. Unlike most barren rocky canyons, Blue Mountain’s slot canyons are moss-covered and forested. Thrill-seekers find their hearts’ content through soggy trails and waterfalls to some of the deepest chasms and precipitous walls. Al-Siq is one of the large slot canyons but still conforming to the description of “deeper than it is wide.” This historic one-mile long gorge is the circuitous and stifling entry way to the ancient city ruins known as Al Khazneh in Petra, Jordan. The tunnel-like gorge measures 10 feet across with towering walls at over 500 feet high along most parts. Al-Siq, which means “the shaft,” was geologically shaped by tectonic forces and later smoothened by water. 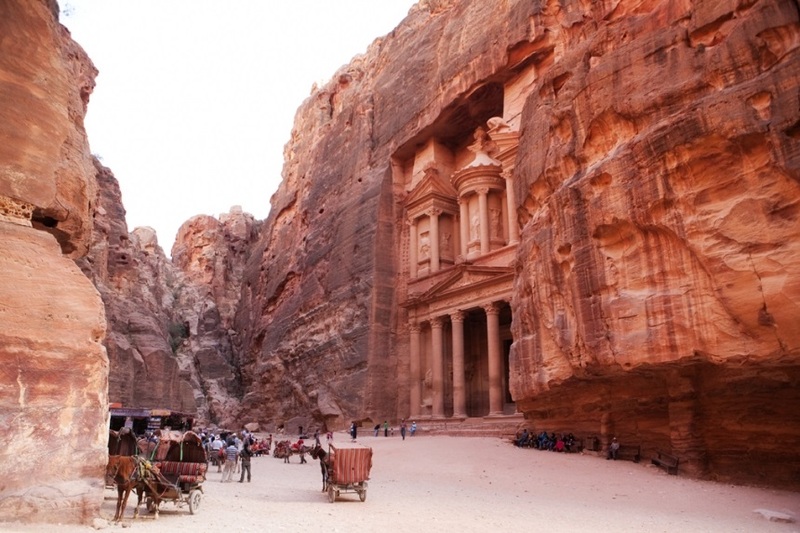 The ancient structure was unearthed together with chambers along the entry way which date back to 1st century BC showing that the Siq was a sacred place. Slot canyons are some of the lesser known quirks of nature. They as astoundingly beautiful and they also offer the most mind-blowing adventures. Be very respectful of every slot you explore, leave no marks and never be an agent of destruction to nature’s genius. Some of these are considered sacred, most are significantly aged, and there are some that could be treacherously dangerous.